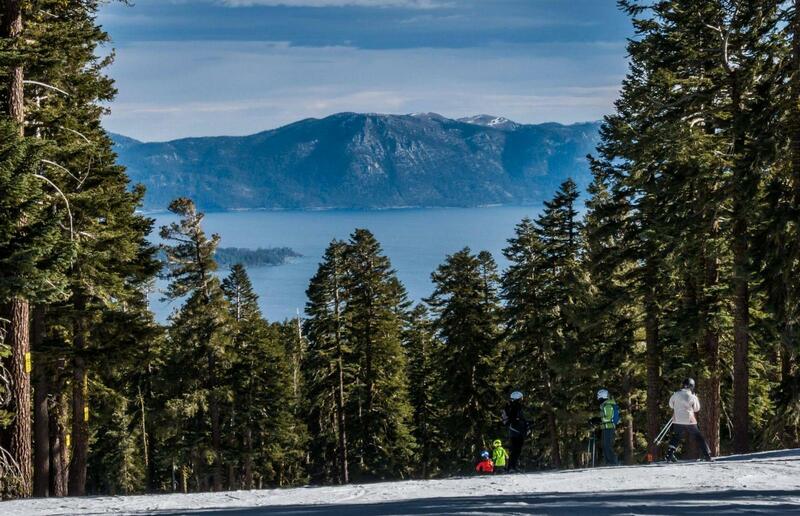 Northstar is a trendy ski resort on the California and Nevada border, the resort is considered as one of those resorts with a bright future. The new skiing base has transformed a traditional skiing loft into one of the most happening ski resorts in the U.S. In terms of skiing, the resort offers plenty of skiing opportunities for different skiers. The resort is not as large as other ski resorts in California and Nevada but it is sufficient for skiers to enjoy the slopes at Northstar. The resort has perfect snow conditions ideal for skiing and snowboarding. Intermediate and novice skiers will have plenty of options to choose from when it comes to skiing at Northstar. The resort is connected by over 20 lifts that include 2xgondolas and trams, 1x high-speed sixes, 1xquad chairs, 7xhigh-speed quads, 2xtriple chairs, and 7xT-Bars. The Northstar is one ski resort that has plenty of gladed ski area to suit every taste; most of the slopes at the resort are suitable for beginners and intermediate skiers. Advanced and expert skiers will be slightly disappointed for the lack of expert slopes for off-piste and some challenging skiing. The longest trail at the resort is 2.9 miles long. The most challenging run is the black diamond Iron Horse, the slope is steep and long. The area near the Lookout Mountain is a popular ski area that is recently added to the resort. This skiing area is about 200 acres and most of the area is suitable for advanced skiers. A high-speed squad called the Lookout Express. The Lookout Mountain has a modern snowmaking machine. The vertical drop of 1.200 feet is steep and offers perfect cruise run. The Lookout has five black marked pistes including Prosser, Stampede, Gooseneck, Boca, and Martis. The skiable area at Northstar has terrain parks to keep the snowboarders entertained. The Adventure Park has something for skier and snowboarder of all ages and skill level. Bumps, halfpipe, jumps, and a special dedicated snow area for children are the highlights of the resort. The skiable area for beginners is located near the Bear Paw Chairlift is perfect for novice skies, the area has several green marked slopes in a single spot. The Vista Express quad chair takes skiers to the Skid trails with the green marked piste LumberJack quiet nearby. The other areas for beginners are the downhill Village Run and the area located near the base of the Big Springs Express Gondola. Most beginners, once they get comfortable on skies of a snowboard, will love the easy blue marked trails located near the Arrow Express Chairlift. Most of the trails in the entire skiable terrain at the resort are suitable for intermediate skiers. With plenty of snowy runs with deep bowls will get powder fans eager and excited to ski in this area. Skiers can access the blue marked pistes at the summit by taking the Arrow Express and the Comstock Express quad chair. The area at the summit has plenty of blue marked pistes for intermediate skiers. The slopes are well groomed. The East Ridge trail located on top of the Vista Express quad takes skiers to the Logger’s Loop. The skiable area. The Woods is perfect for some easy blue pistes, this area is located near the gondola. Intermediate skiers can find expansive slopes near Lookout Road and Boondocks while skiing their way through these areas, skiers can get to the Home Run. It’s easy to return to the resort from this area, take the gondola near the Home Run. Skiers will find plenty of easy blues in the Home Run area. The Northstar ski resort is not the ideal ski resort for expert skiers; the resort has over 27% of its pistes marked diamond black. The Comstock Express and the Arrow Express ski resort offer excellent skiing opportunities for advanced skiers. Skiers can use these chairlifts to get to the East Ridge with other black diamonds located at Sierra Grande. A few black diamond trails are located near the Rail Splitter and the Challenger. Skiers can get to the black diamond pistes at the Challenger by skiing downhill from the Rail Splitter. A limited option for off-piste is located at the bottom of the Backside Express Chairlift, where newly added black diamond pistes are open at the Lookout Mountain. The area has a few steep moguls and several tree trails. The skiable area at the Lookout Mountains is filled with powder bowls and tree trails, the area is connected with the rest of the mountain by the Pioneer chairlift. The other black diamond pistes are located at the Backside tree area because of the abundance of dry powder, skiing is a real treat. A limited off-piste slope is located at the Sawtooth Ridge but they are not challenging enough to be marked double black diamonds for experts. The terrain parks are located at the base of the mountain; this indicates that the parks are easily accessible by several chairlifts. For snowboarders and skiers looking for an adrenaline rush, they can rush to the award-winning snowpark called the Freestyle Park. Snowboarders will have a lot of fun freestyling on the massive bumps, jibs, jumps, tabletops and halfpipe. The best parts of the Freestyle terrain park are located near the Vista Express Chairlift. The snow parks at Northstar have adequate snowmaking machines to keep snowboarders and skiers happy with plenty of powder. The Alpine Bar is a popular spot for après. The massive television screens telecast live sporting events that gather a large crowd in ski season. Live music at the Alpine Bar gives skiers a chance to groove to the beats. Skiers can find some après spots near the ice rink with many bars and restaurants in the area. The Petra is a popular après spot for skiers. The Petra has located near the ice rink, thanks to its large selection of wines and champagnes skiers can unwind and prepare themselves for another day at the slopes. The Tavern 6330 has the best cocktails and Bloody Mary in the entire resort. The bar is particularly popular for its very unique and delectable Bloody Mary. The delicious Bloody Mary is made from local vodkas included the Tahoe Blue Vodka, added to the secret dark Bloody Mary mix. Skiers can enjoy the popular Bloody Mary and other fantastic cocktails at Tavern 6330. This joint serves the best local craft beers and the famous pale ale, porter and IPA. These popular beer styles are a must try for every skier willing to spend their après trying American beer. The Swim and Racquet Club at Northstar ski resort has excellent swimming pools, water-based sports and activities for children and adults and a tennis court. The club has a fitness center, giving skiers and non-skiers to do some exercise and yoga. Professional fitness and yoga experts will assist in relaxation and provide tips on maintaining a healthy mind and body. Snow tubing is an activity that brings everyone together for some thrill, excitement, and fun. Children above 5 are allowed to snow tube under adult supervision. The Tube Town is the perfect spot for snow tubing and other winter activities; the center opens at 4:00 pm. The Tube Town is located at the base of the mountain, taking a snow bike and take a fun ride on the halfpipe on a snowscoot. The snow toys area is available for children 12 and up. The snowshoe tour is the perfect way to unwind and take a relaxing tour of snow with close friends and family. The snowshoe tours have different routes to suit every ability and experience level. Experts who ensure complete safety for the entire team members arrange the snowshoe tours. Equipment and snowshoes are available for rent. The Ice rink at the Northstar Resort is a fun place to be, meet new people or have some fun with friends and family. The ice skating is the perfect way to end a perfect skiing day.